Here you will find the most beautiful beaded bracelets. We have beaded bracelets in various colors such as pink, blue and mint green. With nice charms such as the hamsa hand. 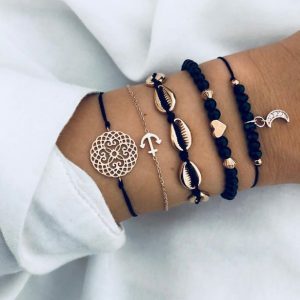 How beautiful is this stylish black bracelets set! This beautiful jewelry set consists of five nice bracelets. Mix and match it with other nice bracelets for an arm party. Complete your look with gold jewelry. For example with a stylish layered necklace or with a choker necklace. Studs earrings will also look nice. 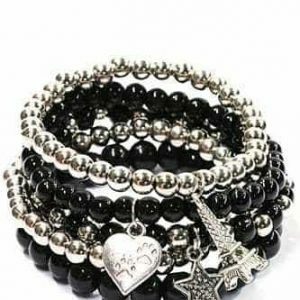 Do you have questions about this black bracelets set? please send us a message. Must have arm candy! This bracelets set consists of 5 nice bracelets. Mix and match it with other beautiful bracelets for an arm party. Complete your look with rose gold jewelry. For example with a layered necklace with coins or a minimalist necklace with a palm tree, heart or world map pendant. Do you have questions about this bracelet set with coins? please send us a message. 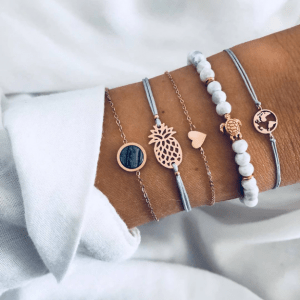 Decorate your wrist with these beauties! This bracelets set consists of 5 beautiful bracelets. Mix and match it with other nice bracelets for an arm party. Complete your look with gold jewelry. For example with earrings with world map pendant. Or with a minimalist necklace with a heart charm. 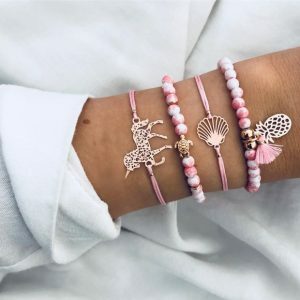 Do you have questions about this pink bracelets set? please send us a message. 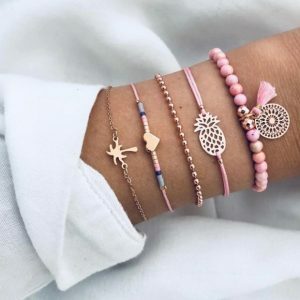 How beautiful is this pink bracelets set! This bracelets set consists of 5 beautiful bracelets. Combine it with other beautiful bracelets for an arm party. Complete your look with gold jewelry. For example with gold studs or with a gold anchor necklace. 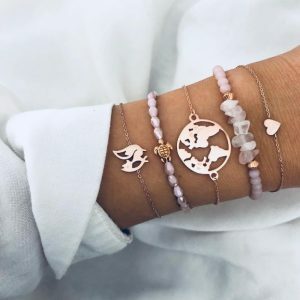 How nice is this bracelets set! This bracelets set consists of 5 nice bracelets. Mix and match it with other beautiful bracelets for an arm party. Combine it with gold jewelry. For example with gold earrings or with a nice long necklace. 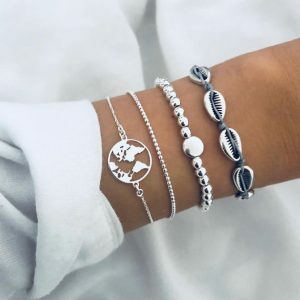 Do you have questions about this lovely bracelets set? please send us a message. 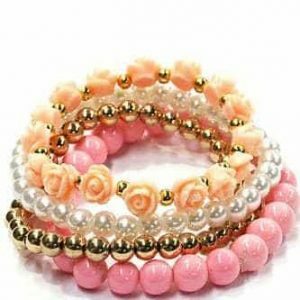 This bracelets set consists of 4 nice bracelets. Mix and match it with other beautiful bracelets for an arm party! Combine it with silver jewelry. For example with a minimalist necklace or with nice earrings. 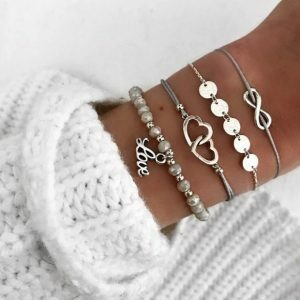 Do you have questions about this infinity bracelets set? please send us a message. This bracelets set consists of five nice bracelets. Mix and match it with other beautiful bracelets for an arm party! Combine your look with gold jewelry. For example with a minimalist necklace with a palm tree pendant or with studs earrings in the shape of a pineapple. Do you have any questions about this bracelets set with palm tree pendant? please send us a message. 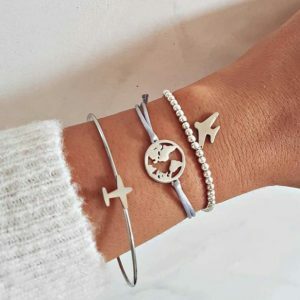 ‘To travel is to life’ This set of bracelets consists of 3 beautiful bracelets. Mix and match it with other nice bracelets for an arm party. Complete your look with silver jewelry. For example with a Y-necklace with a plane pendant or with ear-rings with a world map charm. 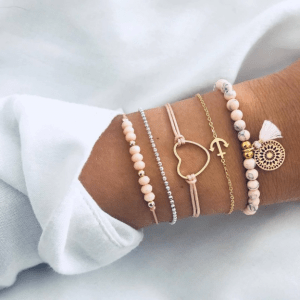 Do you have questions about this 3 piece bracelets set? please send us a message. 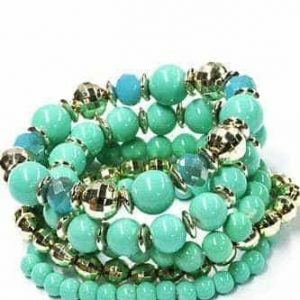 This bracelets set consists of four beautiful bracelets. Mix and match it with other nice bracelets for an arm party! Complete your look with silver jewelry. For example with a choker necklace with shells or with a layered necklace with a world map pendant. Do you have questions about this silver bracelets set with shells? please send us a message. How nice is this pink bracelets set?! 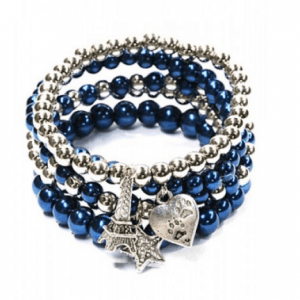 This beautiful bracelets set consists of four nice bracelets. Mix and match it with other bracelets for an arm party. Complete your look with other pink or gold jewelry. For example with a stylish minimalist necklace or choker necklace. It would also look nice with studs earrings. Decorate your wrist with this purple beaded bracelets set! 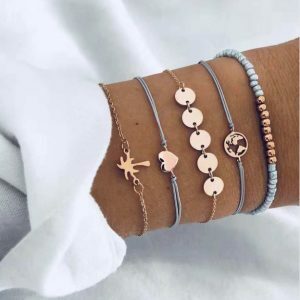 This jewelry set consists of 5 nice bracelets. On one of the bracelets there is an evil eye and hamsa hand charm. Mix and match it with other stylish jewelry. For example with angry eye studs earrings. Or a short necklace with an evil eye pendant. Do you have questions about the 5 beads bracelets set? Send us a message. This colorful beaded bracelet is a real eye candy! On the bracelet there are shells, 3 silver coins and a nice tassel. With this bracelet you can easily take your outfit to the next level. Mix and match this bead bracelet with other nice bracelets for an arm party. Combine it with stylish choker necklace, or with hoops earrings. You can also wear this bracelet with other summer vibes jewelry. Brighten your outfit with this colorful bracelets set. This beautiful jewelry set consists of four beautiful bracelets. Combine it with other nice bracelets for an arm party. Complete your outfit with gold jewelry. For example with nice earrings or with a long necklace. Do you have questions about the colorful bracelets set? Send us a message. We have beautiful beaded bracelets for ladies in our collection. 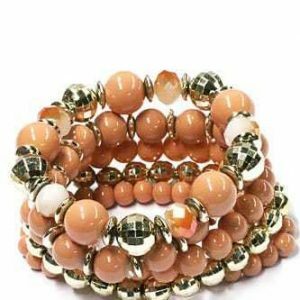 The beaded bracelets with natural stone should certainly not be missing in your jewelry collection. 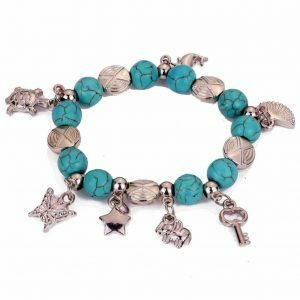 Are you looking for a beaded bracelet with shells, feathers and charms? Then take a look at our ibiza bracelets category. We have colorful bracelets that will brighten up your outfit. The great thing about beaded bracelets is that you can wear them all year round. Both in the cold winter months and in the summer months. You can change your beaded bracelets with dark colors such as brown, black and gray for colorful beaded bracelets. We have them in beautiful colors such as blue, mint green and pink. You can easily combine them together for an arm party. But also with your daily outfit. The beads bracelet is therefore a piece of jewelry that should not be missing in your jewelry collection. You can combine it with other summer style jewelry. For example with a nice ibiza necklace. The ibiza necklace is characterized by its striking colorful design. So they go well with the beads bracelet. You can also complete armparty with a stylish watch. Do you find it difficult to find matching bracelets? Then you should definitely take a look at our category bracelets sets. We have bracelet sets there that are made from only beads. But also a combination of different styles. The bracelets sets with fine bracelets are very popular. Complete your look with other trendy jewelry from Aphrodite. Combine your beaded bracelet with a stone, for example with a beautiful minimalistic necklace from Aphrodite. Don’t have much time in the morning to find the right jewelry together. Then you should definitely have a layered necklace. The layered necklace is a piece of jewelry where several necklaces are connected to each other. Our double necklaces are available in the colors silver and gold. The necklace with multiple layers with coins are very popular. It should not be missing in the jewelry box of the fashionista. You can also combine your new beaded bracelet with the lovely earrings from Aphrodite. The earrings with pendants are very hot at the moment. We also have trendy earrings that will look great with your beaded bracelets. Do you like earrings that are small but nice? then the minimalist earrings are perfect for you. It sometimes happens that your outfit needs a boost. With the statement earrings from Aphrodite you attract all attention to your face, and your outfit gets a boost too. Complete your outfit with a rope anklet or chain anklet. The scrunchies are also very HOT right now! Especially the black velvet scrunchie and the scrunchie with leopard print. Want to stay informed when new beaded bracelets come again? then follow us on instagram and facebook. And certainly subscribe to our newsletter. This way you also know when the beaded bracelets are on sale. We regularly add new items to our jewelry webshop.